Avocado is known as butter fruit in India, a name that comes from its buttery pulp. The fruit is rich in healthy fats known as mono saturated fats and can be quickly metabolised to provide energy. They are also rich in around 20 other nutrients like potassium, vitamin B, Vitamin E and folic acid- a serving of avocado is a sure shot boost of energy and health. It also helps in stabilizing blood sugar, has 35% more potassium than a banana, has anti-oxidants that will boost your immune system and the amount of fibre that is there in the avocado will make you feel full without adding too much to your weight- an awesome way towards weight loss. With so many benefits for the health in general, avocado is great for the hair and skin too. You can reap the benefits of the nutrients in avocado not just by means of consuming it, but also by applying it on the skin and hair. Let’s see how we can use avocado for great skin and hair. Mash up half an avocado and add a few tsp of olive oil to it. Mix well. Apply this on the hair using a brush and wash after half an hour with a mild shampoo. This mask will add a nice rich gloss to your hair. Mix half a mashed avocado with 1/4th cup of coconut milk. Whisk it well. Lightly grease your hair with some olive oil. Now apply this mask on the hair, from your roots to the tip, using a brush. Massage the remaining mask into the hair. Leave on for about an hour and shampoo afterwards. Repeat this mask once in two weeks to get rid of your dry hair troubles. Apply mashed avocado on the scalp in place of your conditioner after shampooing. Rub it along the length of the hair too. Leave for a minute and rinse as usual. The oils in the avocado will help you get rid of the flakes. 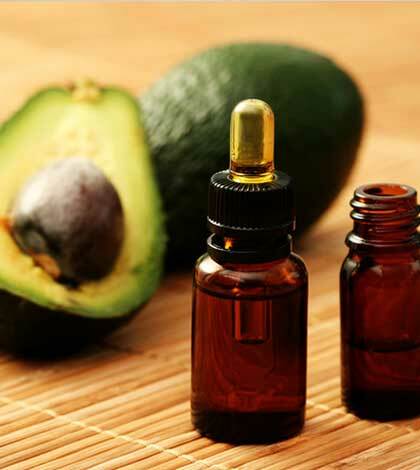 The healthy oils in avocado act as a great cleanser. Scoop out about two spoons of avocado. Mash it well. Wash your face with lukewarm water and pat it with a towel. Now apply mashed avocado on the face and massage well for about ten minutes in upwards and circular motion. The lukewarm water opens up your pores and the avocado cleanses the extra oil and grime in it. Wipe it off with a towel after the massage. Wash off any excess pulp. Repeat this once a week for supple skin. Being rich in vitamin C, avocado helps in reducing the inflammation in the skin and thereby reduces acne. 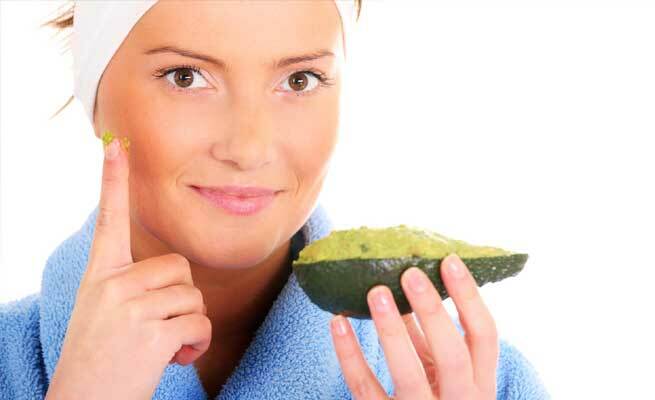 Apply mashed avocado with some lemon topically on the acne prone areas on the face; let it dry before washing it off. Avocado is rich in anti-oxidants so it makes a great treatment for wrinkles. If you want firm skin and get rid of fine lines, then mix half an avocado with some EV olive oil or almond oil and apply it over the face and the neck. Leave it on for about half an hour and wash it off with lukewarm water. Pat your face dry. You can relax with this simple face mask twice a month to slow down aging of the skin. Well, since beauty is all about what you eat and what you apply, every time you have a ripe avocado at hand, consume half an avocado and use the other half as a mask that will leave your face and your hair glowing!